As I mentioned in a previous note, we must have one more den meeting after all. While we planned to practice skits and build the arrows during our "High Rocks" weekend, a few things prevented us from doing that: (1) the "kit" of arrows was not twelve kits as I thought it would be, rather one big kit to make twelve arrows; (2) the boys had little time to practice their skits. 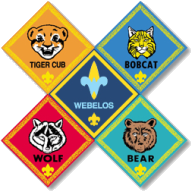 This means there will be one more den meeting for parents and scouts. The scouts will work on their skits with Mr. Kopf, while the parents work on the arrows for their boys. Sunset is at 7:35p so I think we'll have enough twilight to get this done if we start a little earlier than normal. Ssshhh: The arrows are a bit of a surprise so please avoid mentioning it to the boys if at all possible.